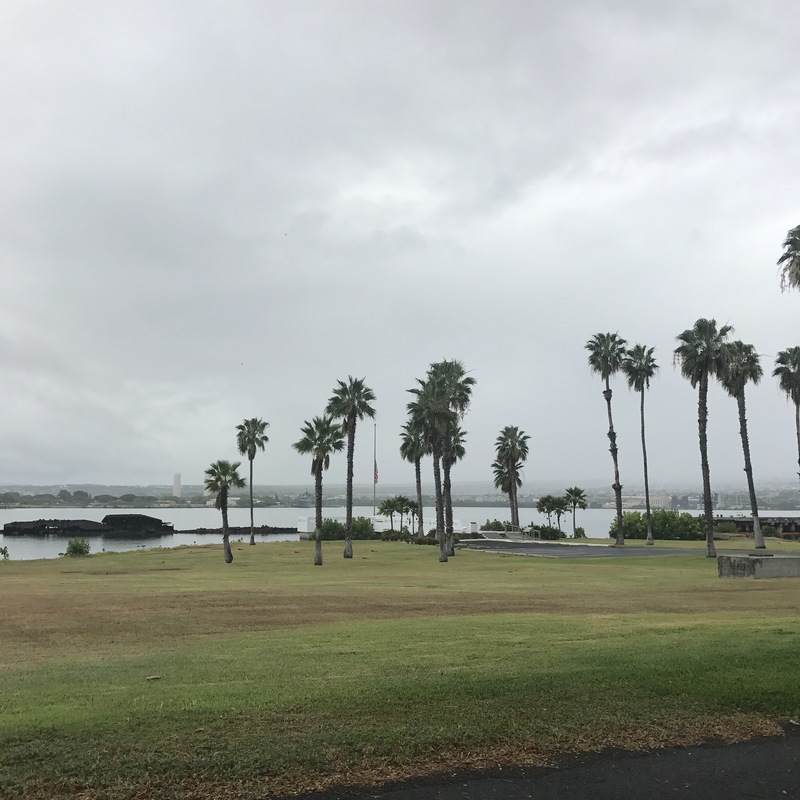 Cloudy day reflects the mood at the USS Utah memorial at Pearl Harbor. I prayed for weather that reflected my mood. I wasn’t feeling sunny, mostly sunny, or partly sunny. I was feeling mostly cloudy. My mood was autumn rolling into winter. The rain began Saturday – a trip to Lanai reminded me of my Pacific NW home and I started to feel better but on Sunday the sun came back. Monday saved me – rain flowing through the gutter of my apartment woke me up. I danced while I made coffee, I sang to the koi fish in the pond, and I cooed at the doves feeding at the bird feeder. But folks here don’t know that rain makes for slick roads. Traffic caused by accidents slowed my commute. Frustrated drivers sped by after passing the firetrucks and cars pulled aside on the shoulder. I giggled at their frustration. I relished being stopped in traffic within the rain clouds collected on the windward side of the Koolau mountains. My only wish being to be able to get out of my car and dance in the rain. I was beaming – this was a real rainstorm and not only a passing tropical shower. Sometimes a good downpour is the perfect therapy for cleansing the doldrums of life. Sometimes to find rainbows you have to walk through a storm.